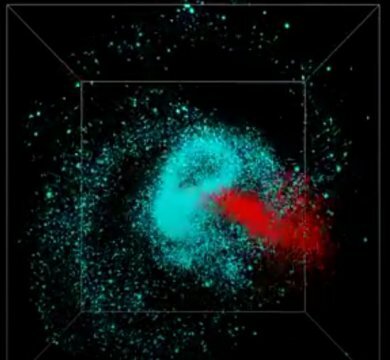 Some ten billion years ago, the Milky Way merged with a large galaxy. The stars from this partner, named Gaia-Enceladus, make up most of the Milky Way's halo and also shaped its thick disk, giving it its inflated form. A description of this mega-merger, discovered by an international team led by University of Groningen astronomer Amina Helmi, is now published in the scientific journal Nature. Large galaxies like our Milky Way are the result of mergers of smaller galaxies. An outstanding question is whether a galaxy like the Milky Way is the product of many small mergers or of a few large ones. The University of Groningen's Professor of Astronomy, Amina Helmi, has spent most of her career looking for 'fossils' in our Milky Way which might offer some hints as to its evolution. She uses the chemical composition, the position and the trajectory of stars in the halo to deduce their history and thereby to identify the mergers which created the early Milky Way. The recent second data release from the Gaia satellite mission last April provided Professor Helmi with data on around 1.7 billion stars. Helmi has been involved in the development of the Gaia mission for some twenty years and was part of the data validation team on the second data release. She has now used the data to look for traces of mergers in the halo: "We expected stars from fused satellites in the halo. What we didn't expect to find was that most halo stars actually have a shared origin in one very large merger."